Europe has some of the most stunning scenery in the world, so it’s no surprise that many people choose to avoid flights and instead drive to their destination. Driving can be more than just a way to get somewhere, it can be a major part of your holiday. However, driving in a foreign country can be a daunting experience, whether you hire a car or take your own. From getting to grips with driving on the other side of the road to seeing speed limits in kilometers rather than miles per hour. But fear not, with a little preparation and forward planning you can stay safe and feel comfortable on your next driving holiday. Where are the safest places to drive in Europe? Using the European Commission’s Annual Accident Report 2018, we’ve calculated where the safest places to drive in Europe are. Denmark takes the top spot as the safest place to drive, reporting just 5 accidents per 10,000 residents annually. Cyprus comes in close second, with 7.5 accidents per 10,000 residents, followed by Finland with 8.5. 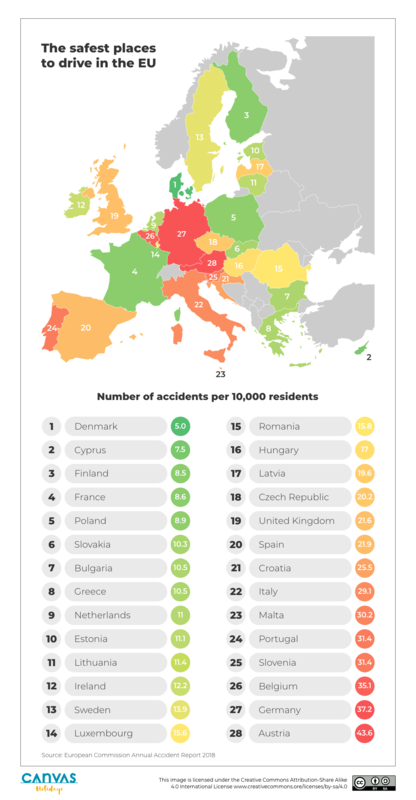 France and Poland make up the rest of the top five, with 8.6 and 8.9 accidents per 10,000 residents respectively. While the idea of driving in a foreign country can seem scary, it doesn’t have to be. Follow our simple top tips and make sure you’re feeling safe and confident on the roads throughout Europe. This may sound obvious, but take some time before your trip to get up to speed with the local rules and regulations, which will vary from one country to the next. Make sure you know which side of the road you need to drive on, what the different speed limits are, and what essential documents and equipment you need to carry with you. For example, in France you need to keep a breathalyzer in your car at all times! The best way to feel relaxed and at ease behind the wheel is to just take your time. While you’re navigating through a new country and getting used to driving on the other side of the road, stay in the slow lane until you feel more confident. And don’t let locals and their different driving habits put you off. If the worst does happen, you want to make sure you will be properly protected. All UK car insurance will cover you for driving in the EU, however this is usually only third-party cover. Get in touch with your insurer beforehand to inform them of your travel plans and upgrade your policy accordingly. Lots of countries in the EU, including Spain, France, Portugal and Italy, have toll roads. Like toll roads in the UK, you’ll have to pay a charge at a gate before you’re allowed to use them. While most tollbooths now allow you to pay by card, it’s always a good idea to keep some loose change (in the right currency) handy in your car, just in case. You don’t want to be caught short and have to change your route unexpectedly! If you’re taking your own car, rather than hiring one, you’ll need to take some headlight converters with you. Your car and headlights will be designed for driving on the left-hand side of the road, meaning they could dazzle oncoming drivers when you switch to driving on the right. You can pick up a set of headlight converters online or from your local garage – usually for around £5 – £10. Want to know more? 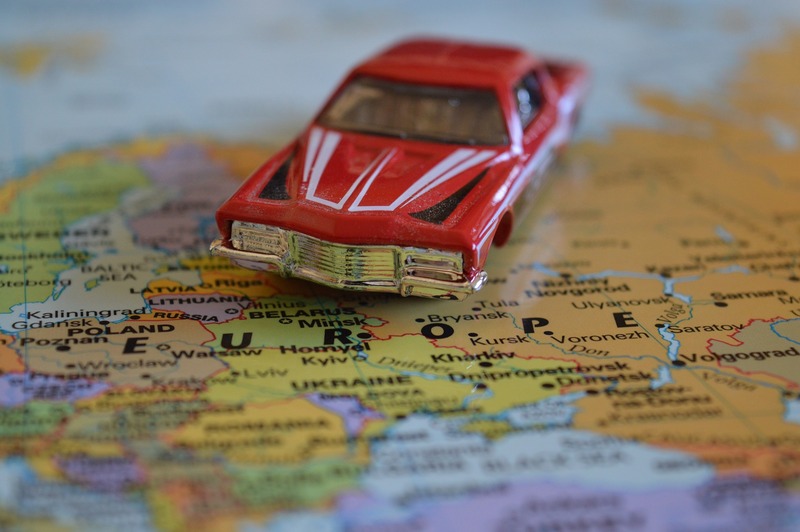 Check out our earlier blog posts that look at what you need to know before driving in Europe.